Peonies are popular perennials that take pride of place in many traditional English country cottage gardens and mixed herbaceous borders. Their longevity, stunning blooms and easy-care nature more than make up for their rather short, late-spring flowering period. There are specimens in gardens that are known to be more than fifty years old and still producing colourful, large, blousy flowers. The spectacular blooms are available in a wide range of colours from clean white and pale yellow, through pink and cerise, to dark crimson. Each flower has three to seven robust sepals and clusters of up to 13 petals, though five to eight is the norm. In many types, the flowers close at night or when it is overcast, and many are beautifully fragrant when open. Wild peonies are distributed across the northern hemisphere, and there is some uncertainty about the number of species, though around 35 seems to be the consensus. They have a close association with ancient art and medicine in Chinese culture, where the typical Paeonia suffruticosa is known as ‘the flower of riches and honour’ or ‘the king of the flowers’. In traditional art, the plant is generally depicted in bud rather than in flower, as it was the buds were believed to hold medicinal qualities. 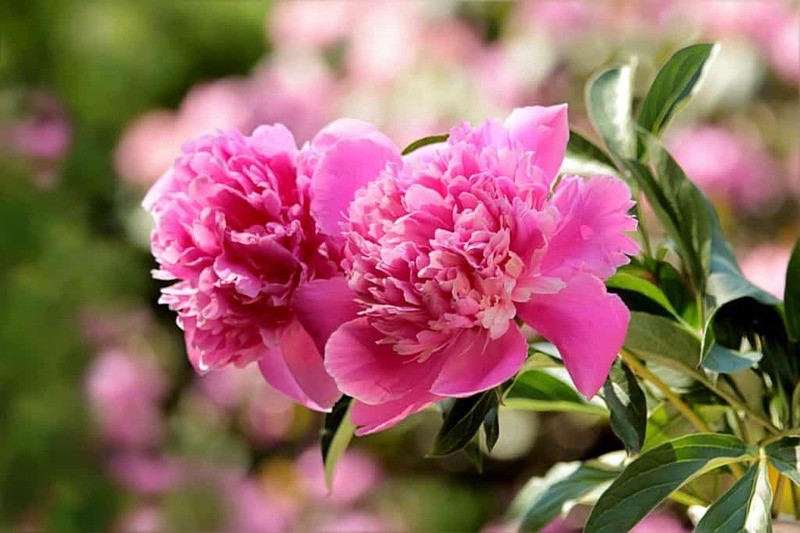 In addition to the well known herbaceous peonies, there are also woody tree peonies, and various modern hybrids between the tree and herbaceous types, known as intersectional or Itoh hybrids. However, this article is about planting and caring for the herbaceous peonies. Paeonia officinalis has been grown in Europe since the fifteenth century, and intensive breeding and hybridisation started in the nineteenth century when Paeonia lactiflora was introduced from China. France and the UK are the traditional centres of peony development, and breeders here have introduced many new garden varieties, mainly based on Paeonia lactiflora. Cultivars such as ‘Avant Garde’, ‘Mai Fleuri’ and Le Printemps’, all varieties from the hybrid between P. wittmanniana and P. lactiflora, have been popular with gardeners since the early 1900s, and are still available. Today, the Netherlands is the commercial focus of cut peonies, producing an estimated 50 million flower stems each year. Some 20 million of these cut stems are of the double pink variety ‘Sarah Bernhardt’, which dominates commercial peony flower production. Peony flowers are often split into singles, doubles, semi-doubles, Japanese, anemone and bomb types. ‘Duchesse de Nemours’ is a very popular peony with superb, double, 25cm diameter white flowers with a cream centre and a very pleasant lily of the valley type of fragrance. It will reach 90cm in height, and will need staking when in full bloom. ‘Sarah Bernhardt’ has sweetly scented, pale-pink flowers, and it is the favourite peony variety with commercial cut flower producers. In addition to its good looks, it has the bonus qualities of good disease resistance and an extended vase life of more than two weeks if cut in bud and kept cool. It will grow up to 90cm tall, and has the RHS Award of Garden Merit. This variety has subtly pink double flowers that produce an intense fragrance that lingers in the garden. This scent, the 1m tall stature, and the large, showy flowers give the plant a real presence that attracts admiring attention. The buds are quite slow to open, and the petals that emerge start as pale pink and then gradually turn to white with a tinge of blush pink towards the centre. ‘White Wings’ is one of the best choices for a true white variety that is very attractive to pollinating insects. While it is a little more shade tolerant than other varieties, it still looks at its brightest best in full sun, where it will also attract the greatest number of butterflies and bees. It grows to 85cm in height, and has dark green leaves and large, single and fragrant white flowers formed of ruffled petals around a central hub of golden, pollen-rich stamens. ‘Bowl of Beauty’ has cupped, 20cm diameter, cerise flowers with a prominent central tuft of creamy-white petaloids. It will grow to 80cm tall. It was awarded the RHS Award of Garden Merit following extensive horticultural trials. This recently introduced cultivar became very popular after its appearance at the Chelsea Flower Show in 2016. It has been given the RHS Award of Garden Merit. It has candyfloss-pink flowers when they first open, but they soon change to an unusual orange-pink or coral colour, and then finally to an apricot yellow. The plant grows up to 90cm in height. This white peony has a tinge of lemon yellow, and makes a particularly good cut flower with a long-lasting scent both on the plant and in the vase. This subspecies of Paeonia mascula is a native of many of the eastern Mediterranean islands. It is quite compact at 60cm tall, and it has grey-green foliage flushed with purple. The rich pinkish-purple flowers are single, pleasantly fragranced, and have a central circle of attractive, pale yellow stamens. The large, open flowers are rich in nectar and pollen and are great for pollinating insects. A great choice for the dark red end of the spectrum, this variety has large, deep crimson flowers, and grows up to 75cm. It has the RHS Award of Garden Merit. ‘Blaze’ has single flowers with vivid, scarlet petals and a bright central disc of golden stamens. The flowers are held on strong stems up to 90cm tall, with emerald green foliage that lacks the red tints that peonies generally display. It is an easy to grow variety with hybrid vigour that consistently flowers well, producing up to 20 flowers per plant once established. For gardeners that like to include some of the species peonies in their plantings, this Majorcan peony makes a compact herbaceous perennial up to 45cm in height. It has the RHS Award of Garden Merit. The stems are an attractive red colour, complementing the purple-tinged foliage, and it produces bowl-shaped, rose-pink flowers that are up to 10cm in diameter. As with many of the single-flower species, it is very attractive to pollinators and will attract masses of bees and hoverflies. Many of the yellow peonies rely on the intense colour of the central stamens to give the overall yellow impression to the flower, but this species, known as Mlokosewitch’s peony, has true lemon-yellow petals. The 12cm diameter, single flowers are attractive to pollinators, and the plant has the RHS Award of Garden Merit. Peonies have an extensive system of thick, tuberous storage roots and thin feeding roots for harvesting water and nutrients from the soil, and these govern the best approach to buying, planting and dividing peonies. They can generally be bought from garden centres or specialist nurseries as either bare-root or pot-grown plants. Peonies take time to establish once planted, and some patience is needed while waiting for the first flowers. Bare-root plants should be bought with at least three or four growth buds, and these will develop into established flowering plants within one or two years of planting. Container-grown plants generally have fewer growth buds and often take longer to establish once planted out into the garden. The best time to plant peonies in the garden is the autumn, though they can also be planted out in the spring, though not always so successfully. The bed should be prepared by incorporating a liberal application of organic matter such as garden compost or well-rotted manure. The addition of a general fertiliser such as blood, fish and bone at around 70g per square metre is also a good aid to establishment on poorer soils. The most important consideration when putting in peonies is not to plant them too deeply, or they will not flower. The tuberous roots should not be planted more than 3cm below the surface of the soil, though some of the more vigorous cultivars may put up with a 5cm depth of cover. New plants should be watered in well, and then again frequently during any dry spells in their first year to aid establishment. Mulching will help to conserve water and keep the soil in ideal condition, and also to suppress competing weeds. Organic matter such as composted bark, garden compost or well-rotted manure should be spread in a layer between 5cm and 10cm deep, but avoiding the crown of the plant to reduce the chances of causing rot. Once established, peonies require very little help in rich, fertile soils. If the soil is poor and has not been regularly mulched, the addition of a handful of balanced general fertiliser such as blood, fish and bone in the spring may be beneficial. Many of the taller varieties with larger flowers will require some support during the flowering period, or the weight of the blooms can tend to make the stems flop over. Canes and twine can be used, though the easiest solution is a purpose-made, plastic-coated wire herbaceous plant support frame that pushes into the ground around the plant temporarily. If these are set out when the plant reaches about 30cm in height, the foliage will develop around them and disguise them throughout flowering. The foliage will naturally die down in the autumn, and for the best garden hygiene the stems and foliage should be cut down to ground level and removed once flowering has completely finished. Peonies do best and flower most freely in a sunny position, though a few types will grow well in dappled shade for part of the day. Peonies are relatively drought tolerant when established, though flowering may be impaired during particularly dry spells at the time of flower bud development. Peonies do well in any fertile, free-draining garden soil, especially chalky loams, and they will tolerate mildly acidic sandy soils. Clay soils are generally acceptable, provided that the drainage has been improved by the addition of sufficient grit and compost. Some of the species peonies such as such as Paeonia anomala require a slightly acidic soil. Plants grown on rich, loamy soils do not generally require feeding. Plants in poorer, sandier or less organic soils can be improved by an annual spring feed with a balanced general fertiliser at the rate of 70g per square metre. Do not use high nitrogen fertilisers, as these will promote foliage growth over flowers. Peonies do not generally do well in containers because of their tuberous and rather fragile root system. If necessary, for example when redesigning the garden or even moving house, prized peonies can be lifted very carefully in the autumn after removing the dying foliage, and can be kept temporarily in large containers of a soil-based compost such as John Innes No 3. The compost must not be allowed to dry out, but there must be free drainage. The plant should be re-established in its new position in the garden as soon as possible, provided the ground is not frozen and there are no frosts expected. Peonies are an essential component of mixed herbaceous borders, and mixed with traditional favourites such as foxgloves, perennial geraniums, hollyhocks, candytuft, delphiniums, perennial geraniums and phlox they epitomise the quintessential English cottage garden style. 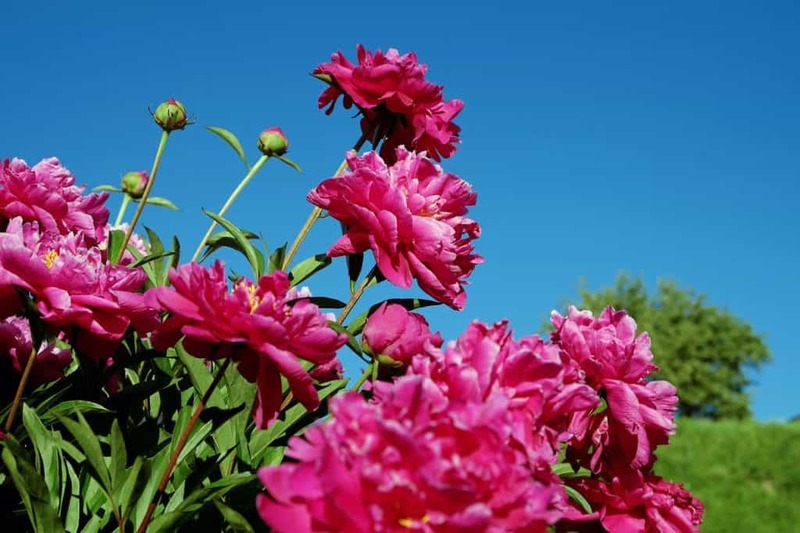 Peonies do not require pruning, but the dead flowers should be removed as they fade, and the whole plant cut back after flowering or before the foliage begins to die down in late summer. Peonies can be propagated by division or from seed. To divide clumps, remove the foliage and lift the tubers with as much intact root as possible in the autumn. Established plants have deep and brittle roots, so great care is needed. Gently wash off the soil to reveal the growth buds on the tuber. Divide the tuber using a sterilised knife, ensuring that three or preferably four buds and plenty of feeding roots remain on each piece. Replant as soon as possible into well-watered soil with added organic material, with the top of the tuber and its growth points no more than 3cm below the soil surface. The penalty for producing the new plants is a delay in flowering for all of the parts, as these may take a couple of years to settle sufficiently for them to start flowering once again. Species peonies are self-fertile and can produce seed true to type. However, in an open garden, the chances are that they will be cross-pollinated by bees or other insects, so offspring germinated from seed is unlikely to be true to type and may be of questionable quality, leading to potential disappointment after several years of patiently waiting for flowers to appear. Not all of the cultivars and hybrids will produce seed, and similarly this is unlikely to be true to the parent in garden conditions. For successful germination, peony seed requires two periods of chilling with a period of warmth in between. The root emerges after the first chill, and the stem and leaves are delayed until after a second period of cold exposure. Freshly collected seed should be sown in summer, 2.5cm deep in containers filled with a good quality soil-based seed compost. The surface should be kept moist, and can be covered with a thin layer of horticultural grit or vermiculite. The containers can be kept outside or in a cold frame. With the need for double chilling and an establishment period, it can take seedlings a couple of years to appear and around five years for them to flower. Bought seed is generally more problematical, and it may take even longer to get from seed to flowering plant. Generally, only a small proportion is successful. Peonies seldom experience significant pest or disease problems. They are avoided by deer and rabbits, one of the reasons that they became popular as rural country garden plants. Infestation by bud eelworm, a nematode, can lead to leaf discolouration, bloom distortion, wilting and the loss of the plant. Eelworms live within the plant’s tissue and affect foliage and stems as well as flower buds. There is no remedy and plants should be dug up and destroyed. The foliage can also be damaged by some types of caterpillars, such as those of the swift moth. These become more evident if searched for after dark with a torch, when they can be removed by hand. Ants are often attracted to the nectar that is secreted on the outside of the flower buds, but they do not cause any damage and may help to remove pests. A grey mould blight known as peony wilt can cause plants to wilt and die back, though it is infrequent in healthy plants in good growing positions. Badly affected plants may have to be removed, and they should be replaced with a more resistant type. Rare and less serious diseases include peony ring-spot virus, which causes yellow rings on the leaves, and peony blotch, characterised by grey-brown leaf spots with red margins. Honey fungus spreading out from its more usual tree and shrub hosts can also adversely affect peonies. Q I have an expensive peony that flowered for a year or two but no longer does. I look after it and mulch well each autumn and spring. It was just what I needed for the position and I cannot find a better replacement. Shall I give up on it and dig it up? Assuming that the plant is not in a shaded position, then it is probably too deep in the ground. This may be because it was planted too deeply, or it sounds as though your diligent mulching could have buried it too deeply over the years. In the autumn, clear back the foliage and very carefully lift it. Dig over the soil to incorporate any excess mulch and then simply replant it so that it is only 3cm or so beneath the soil surface. One shallow winter mulching should be sufficient going forward. Q My wife is a keen flower arranger and much enjoys using peonies from the garden. She is pestering me to extend the season that I grow them so she can have peony flowers over a longer period of the year. Is this possible? Peonies make excellent cut flowers and, if picked in bud or early flower, they should last for at least two weeks, provided that the water in the vase is refreshed frequently. As each plant has a limited number of flowers, large-scale picking for the vase can deprive the garden border of its interest and colour, so it is well worth considering adding a row or two of good flowering varieties such as ‘Blaze’ and ‘Sarah Bernhardt’ to a dedicated cutting garden, or to the vegetable garden or allotment. Your wife may have noticed that commercially grown peony flowers are seldom available out of season, and this is a good indication of how difficult it is to extend the rather short spring flowering period. Enjoy them while they are available – and treat late spring as the special time of year for peony arrangements.